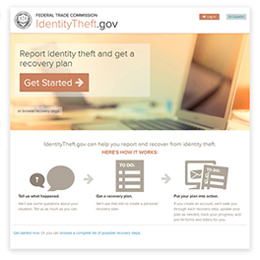 NEW: Identity theft victims can now go get a free, custom identity theft recovery plan through the Federal Trade Commission’s IdentityTheft.gov website. The new one-stop website works with the FTC’s consumer complaint system, allowing consumers who are victims of identity theft to quickly file a complaint with the FTC. Then they can get a custom guide to recovery that helps simplify many of the steps involved. The upgraded site is mobile and tablet friendly. It offers easy-to-use tools to help identity theft victims create the documents they need to alert police, the main credit bureaus, the IRS and others. Read about Tax Identity Theft. Kansas Legal Services also offers help in creating letters to send to major creditors and reporting agencies, please read below. In some cases, thieves may have received medical services in your name, re-routed your tax refund, or even posed as you during contact with law enforcement. In some cases, identity theft occurs within families to children, seniors, and domestic violence survivors, making reporting and recovery particularly difficult. Even if you are able to resolve a financial identity theft issue with your bank, this use of your name and credit history can result in other problems. You could get collection letters for things you did not purchase. It can also result in negative entries on your credit report, causing you problems in getting credit or paying a higher interest rate. Becoming the victim of an identity theft can be a complex and frustrating time in your life. The Federal Trade Commission has created letters (in this booklet) that consumers can use to let a debt collector or credit bureau know of the theft of your identity. To use the letters, you must first report the crime of identity theft to the police. You do not need to know the name of the person who used your identity. You show the police the debt collection letters or other proof that you are the victim of this crime. The Federal Trade Commission offers forms and sample letters for victims of identity theft that help you get started. When using these online forms, please sign in and create an account because you need to save your answers often while completing the forms. The data provided and the interactive interviews will give you legal info, not legal advice. Neither the U.S. Department of Justice nor any of its components run, control, are responsible for, or necessarily endorse, these materials. This includes, without limitation, its content, technical setup, and policies, and any services or tools provided. NOTE TO USERS OF CHROME and FIREFOX: The backspace button does not work to delete or modify answers in these interactive interviews. You must use arrows or your mouse to highlight the info you need to change. Then use the delete key to remove letters, before you can change information. This problem is not faced in Explorer. Use the interactive interview to respond to someone collecting a bill that is in your name, but that you did not permit. You will also need to give a copy of your proof of your identity. Click below to use the interactive interview for a Letter to a Creditor, directly collecting their own bill. This might be a credit card statement you received that has charges you didn’t make or allow. It can be any situation where your credit or identity was used without your permission. Use the interactive interview for responding to a company or law firm that is a Debt Collector, or collecting a bill that is in your name but you did not permit. You will need a copy of their letter in hand when you start the interview. You will also need to give a copy of your police report and proof of your identity, by copying these and putting them in the letter. Click below to use the interactive interview for a Letter to Debt Collector. Use the interactive interview to create a letter to a Credit Bureau, seeking investigation and removal from your credit report of items that are the result of identity theft. You will need a copy of your credit report in hand when you start the interview. You can obtain a free copy of your credit report from each credit bureau here. (https://www.annualcreditreport.com/cra/index.jsp) You do not have to pay for a copy of your credit report. One credit report from each company is offered to you free each year. If you have been sued for a debt that isn't yours, but were created in your name (identity theft), you can use this interactive interview to file a defense to the lawsuit. This document is called an Answer or Reply to a Petition. There are deadlines for filing this answer. These are stated in the Summons that is attached to the Petition. Filing the answer is just the first step in the process. You will still need to appear in Court and present your defense. Click HERE to get more info and to find the interactive interview to prepare your answer. More info on identity theft. Go to this page to learn about your options. Protect yourself from identity theft The Kansas Attorney General's website gives you helpful tips. IF you have lost money, due to identity theft, you may ask the Kansas Attorney General's office to investigate and consider civil action or criminal charges. Use this form to ask for an investigation by the Kansas Attorney General. More resources here, on tax identity theft and recovery from identity theft. ► Are you a consumer with a complaint or wanting more information? Here is a link to the Office of the State Bank Commissioner of Kansas where you can file a complaint about a bank or financial institution or find consumer-related resources that may be helpful to you. If you have questions about technical aspects of any of the interactive forms on this page, please read Frequently Asked Questions About Interactive Forms or use our LIVE CHAT. Just click on the icon in the lower right-hand corner of this page.